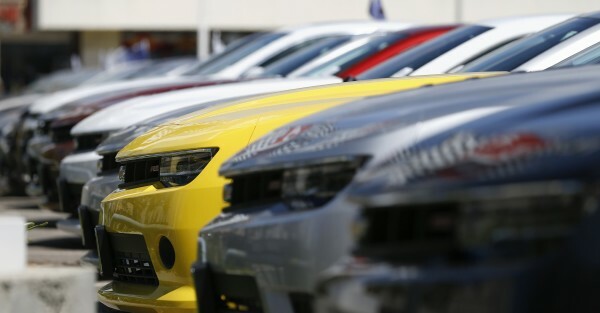 A group of Chevrolet Camaro cars for sale are pictured at a car dealership in Los Angeles, California in this April 1, 2014 file photo. Last year was another good year for auto dealers, according to the 2014 financial profile of franchised new-car dealerships from the National Automobile Dealers Association (NADA). Auto sales have grown for five straight years at an average 9% growth rate. Dealerships across the nation employ more than 1.1 million workers, and wages have increased 3.3% on average since 2011 to the current annual average salary of $55,000. Yet the net profit margins are a thin 2.2% of total sales and have been for three years in a row, while gross margins as a percent of total sales continued its five-year slide to reach 13.1%. While NADA is correct in saying it is a good year, the definition of a good year in auto dealerships is a bit more generous than in other industries. According to Steven Szakaly, Chief Economist at NADA, the 2.2% margin is at least a full percentage point less than that of many other retailers. The intense competition among dealers and the large choice of models make auto dealerships a perpetual low margin business. Even so, people are still willing to enter the business. The NADA report claims there were 16,396 new-car dealerships in the US as of the end of 2014 — an increase from 2013 of over 200 outlets (or “rooftops” as they are known in the industry). Total sales at the average dealership were slightly over $49.1 million, with $28.3 million of that total as new car sales (57.6%), $15.2 million in used car sales (31.0%), and $5.6 million in service and parts sales (11.4%). However, with respect to profit, the order is reversed. Service and parts produce the largest component of net profit, according to NADA graphs. As you might expect, the incentive keeps service contract penetration rates quite high, hovering around 40% over the past three years. On the expense side of the ledger, things appear to be relatively in check. Total expenses did rise 4.7% but were actually lower as a percentage of sales (from 11.2% to 10.9%) thanks to the sales increases. The NADA report paints a relatively stable picture. However, imagine how difficult it will be for auto dealers if Tesla succeeds and breaks through the legislative wall that keeps auto manufacturers from selling directly to customers. The auto dealership as we know it would cease to exist or be replaced by some other model, much like Internet shopping did to Best Buy and the now defunct Circuit City. Given that context, we can see why auto dealers are content with a steady yet thin profit margin. It could be worse.